Forever White Plus is a 5-day, 15-minute per day, home tooth whitening system. It is the easiest, most comfortable, fastest process of home tooth whitening ever developed. Each kit contains 10 universal fit, soft foam disposable trays, pre-filled with precisely the required amount of whitening gel to cover the teeth.The gel is specially formulated to prevent sensitivity. 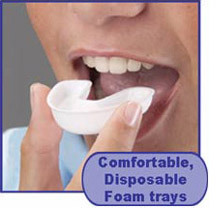 The trays are specially designed so the gel will whiten both the front and back of the teeth. Teeth are translucent, so stains on the back of the teeth can show through to the front. If those stains are not removed, the teeth will never become as white as they can be. No longer do you have to boil trays to make impressions of your teeth in order to fill those trays with the proper amount of gel, without having the gel overflow into your mouth and down your throat. With Forever White Plus, you just open the package, place the pre-filled tray in your mouth, and you are ready to whiten.